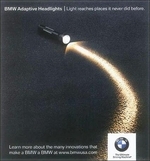 I have found some funny BMW advertisements in this thread and I thought I would share it with you. I’m sure you will like them very much! This post has the first 20 advertisements. There’s more to come, so stay tuned. I will be posting the second group soon. Mean while enjoy them and let see which one you like best?